Test for Precognition: Precognition is the knowledge of something in advance of its occurrence, especially by extrasensory perception; also called clairvoyance. Test for Psychokinesis (PK): Psychokinesis is the movement or influence of physical objects by the mind without use of physical means, also called PK. Test for Telepathy: Telepathy is the communication between minds by some means other than sensory perception. Using Random Number Generators to test for PSI phenomena is not new, see history section. Precognition: Testing for precognition is simple. Predict the next 60 colors that the ESP Lamp will generate on a piece of paper. Then observe the ESP Lamp and mark the results against your guesses. Chance for guessing the right color is one out of four (p=1/4). So chance alone will provide an average of fifteen correct hits out of sixty calls. However, any number of hits within the range of 9 to 21 hits is NOT considered significant, because this range is within two standard deviations from chance. But any number of hits above and below this range is significant and is considered showing ESP/PSI activity. Psychokinesis (PK): Use your mind to influence and output from the ESP lamp; either greater or lesser than chance. In other words create a deviation in the output distribution. Choose a single color (or number) to intend. Try to make that color come out, write down the next sixty ESP Lamps’ colors while trying to intend your color. Chance will provide approximately 15 hits. Anything above and below the range 9 to 21 range shows is statistically significant. It had been observed that groups of people all intending the same color or number have a higher success rate than individuals. This could be a game to try at your next party. Telepathy: Two people in separate rooms, one is a sender the other a receiver. 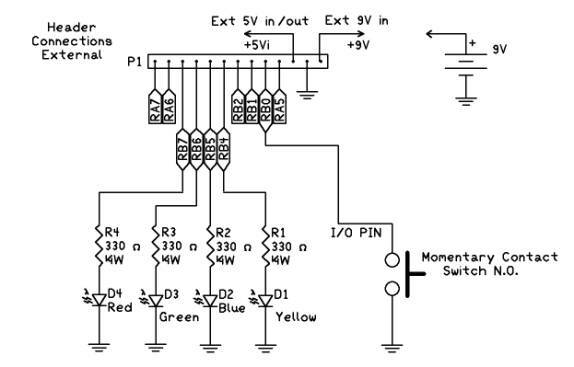 The sender observes the ESP lamp, and tries to transmit the ESP Lamp color changes when they occur, to the receiver. A signal must be established between the sender and receiver. The sender signals when the lamp changes color, then the receiver tries to receive the impression of the color from the sender. Both the sender and receiver logs the colors for comparison later. It’s easy to be cynical about the ESP lamp and minimize the significance of the experiments and technology it represents. Other scientists whom employed rigorous methodology and authored peer-reviewed materials have drawn conclusive results, that show a weak but definite ESP/PSI abilities of the human mind. Studies based upon the statistical analysis of the results obtained using REG’s and RNG’s. For anyone wishing to pursue further research, use the internet to search the following terms; Helmut Schmidt, PEAR, Dean Radin (IONs) and Global Consciousness Project. These searches will generate a wealth of information based on science and to form a solid foundation of this research. Randomness is defined as a lack of pattern or predicibiity. For our ESP game we have four colors. The probability of any color coming out is 1 out of 4. Probability (P) = 1/4 or 0.25. While the outcome (color) is random (unpredictable) the proportion of times each color would come out over time will closely approximate 25%. We can use this proportion as a simple test to the randomness of our generator. Random number generators attempt to generate random numbers that are equally likely. We can test for a uniform distribution of the output numbers. Knowing that if all possible values are equal or uniform we will find a uniform distribution. Frequency tests examine whether the frequency of different random numbers is consistent with a uniform distribution. For the sake of our example, lets assign numbers 1-4 for our four colors red, green, blue and yellow. Our generator outputs, four colors. 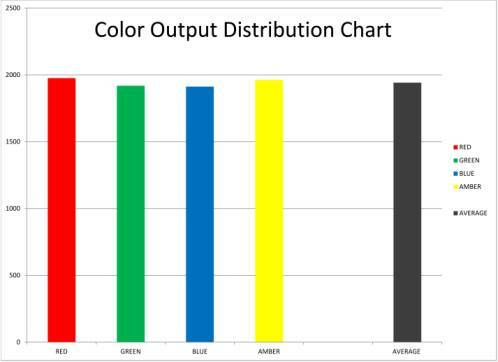 After a run of 1,000 we would expect to see an approximate equal distribution of output colors. The variance of the distribution should fall within one standard deviation of the sampling number. The following illustration is the LCD output from Image's stand alone random number generator. The output is as follows, red 1976, blue 1912, green 1919 and amber 1962. 1976 + 1912 + 1919 + 1962 = 7769 total. To check for deviations in our output we subtract the average from our distribution number. You choose the one with the largest deviation. In this case red at 1976. A Z-score of < 1 shows randomness. Higher Z-scores may also be random in short and unpredictable, it is only under large sampling that you would be able to see that the output is not adequately uniform and thereby not completely random. If the randomness of the generation is true, then it can be used to test for ESP/PSI phenomena. If we took the numbers displayed in the lead photograph of the ESP Tester Project, the total equals 229, the average is 57, the SD is 7. The Z factor is 0.42. Not bad for a human hand input random number generator. Helmut Schmidt, a physicist for the Boeing Company Laboratory, created a number of RNG used for mind-over-machine experiments back in 1969. The use of electronic RNG and REG began with his experiments. One experiment used a RNG connected to four colored lights, in a similar manner to the ESP Lamp. His experiments concluded that the human mind can influence the RNG output to produce statistical deviations from chance. The Amazing Kreskin, offered a electronic ESP tester through Edmund Scientific in 1975. This ESP tester used a RNG to lit one of four different colored LEDs. In one ESP/PSI test scenario, the user would select which LED he thought would light next, then used a switch to have the RNG/REG select a light randomly. The user kept track of his hits and misses to determine if they were exhibiting any ESP / PSI potential. Dean Radin, PhD, is the Senior Scientist at the Institute of Noetic Sciences (IONS). He has written extensively on PSI phenomena and experiments, far more eloquently than I have. His books The Conscious Universe and Entangled Minds are pivotal. Global Consciousness Project started in 1998 has the premise, that human consciousness can have an impact on the output of Random Event Generators (REG). The impact being that statistically the REG will become a slightly less random. If this premise is true then global events ought to have an impact on the output of REG's.